A stunning diamond engagement ring with a delicate band of manmade diamonds on three sides. Available options: platinum, 14k or 18k gold: white, yellow, rose. All of Ada's bridal pieces are fully bespoke and made-to-order with diamonds hand selected for optimal quality, fire and brilliance. Ada Diamonds Design Description- Let your lab grown diamond shine atop a dainty band with manmade diamonds on three sides. 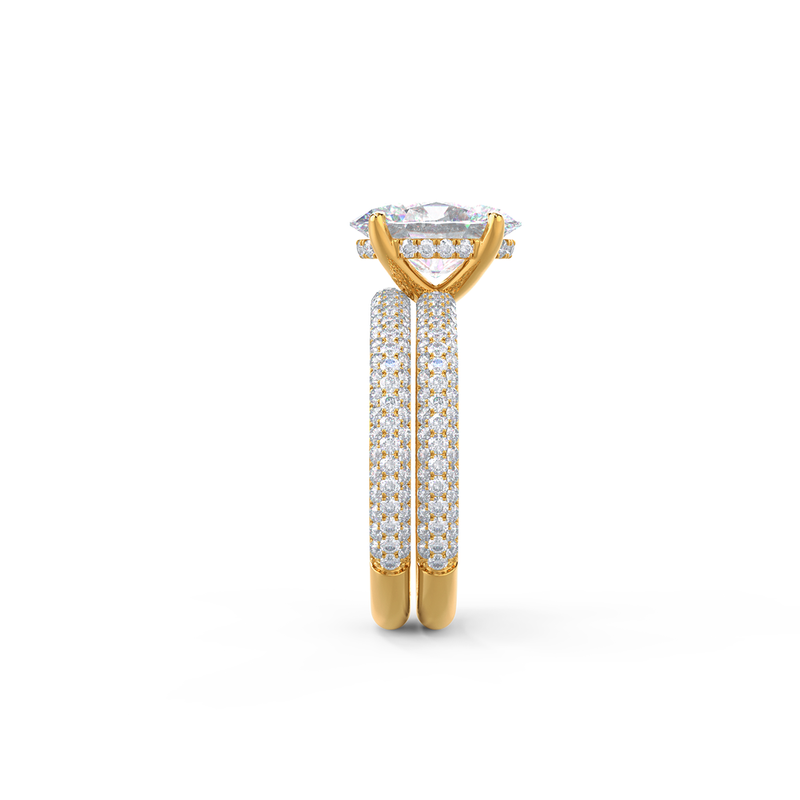 This setting features petite prongs and a diamond gallery support bar. Shown with oval and cushion center stones. Starting at price assumes DEF/VS lab grown diamonds set in 18k gold. Platinum available for an additional $300 fee. This setting may be created without the diamond gallery bar at a reduced price. All of Ada's engagement rings are fully bespoke and made to order. Our friendly Diamond Concierge are here to help you create the perfect ring customized to meet your needs with our conflict-free lab diamonds hand selected for quality, fire, and brilliance. Inquire to get started or learn more about our exclusive Concierge Experience. Not sure what custom style your sweetheart desires? Ensure your proposal is a complete surprise! Proposal Settings are solitaires set with your choice of center stone that are ready to ship in 1-2 weeks. Should you or your partner decide to upgrade, you may apply the cost of the solitaire setting towards a bespoke ring after the proposal and enjoy a complimentary re-setting. Learn more about Proposal Settings and our custom design process. This setting allows for a wedding band to sit flush with no gap. Ada was founded by a husband-wife team.